St. Patrick's Day originated as a cultural and religious holiday commemorating the patron saint of Ireland. Over time it has become a more widespread holiday with parades, special food, parties, music, wearing of the green, and drinking. This is a guide about celebrating St. Patrick's Day. 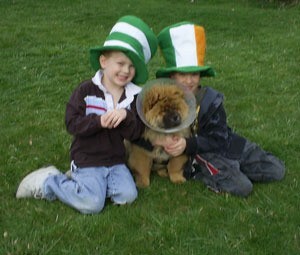 Here are Susan's grandkids celebrating St. Patrick's Day in their very special hats. The conehead in the middle is their new puppy, Honey. Happy St. Patrick's Day from everyone at ThriftyFun. St. Patrick's Day is great time to get together and have a party. 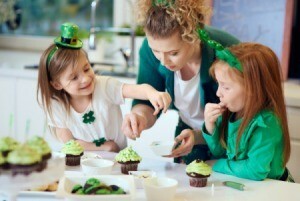 This is a guide about St. Patrick's Day party ideas. 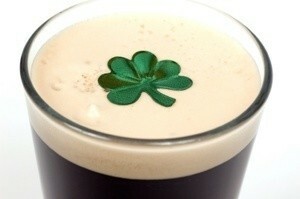 Does anyone have any tips for St. Patricks day? Hi, I live in Hot Springs, Arkansas, You can attend the Worlds Smallest St.Patrick Day Parade. you can dye food green. Hide gold coins (I made some out of yellow felt). Also, leprechauns are silly or naughty, depending if you're trying to teach your kids or not, so just doing some silly things around the house for the kids to wake up to might be fun for them. Like putting the couch cushions upside down, turning a rug sideways, etc.